The world of negotiating is filled with so many pearls of wisdom that even the biggest cynic would readily admit some are tried and true and impossible to argue with. But sounding good and right on paper versus actually following through and adhering to that advice can sometimes be a slippery slope for even the most battled-tested consumer. For me and my obsessive chase to collect every issue of Amazing Spider-Man, I always struggled to wrap my head around being willing to walk away from a purchase if the circumstances (i.e., price, condition of the comic, attitude of the seller, etc.) just didn’t sit right. Certainly the archives of this blog are filled with anecdotes of me not trusting my instincts, or in some cases, my own two eyes, and making a purchase I would almost immediately come to regret because I was being foolish, emotional or both. That’s because, when it got down to the nitty gritty of my quest, I always had this fear that if I was too selective, and too afraid to pull the trigger on a purchase, I might never get the opportunity again. And don’t even talk to me about getting a BETTER opportunity than what was immediately before. So you can probably guess where this story is going. About a decade or so ago, I was at a local comic book show when I saw a copy of ASM #43 on the special “wall” many dealers will keep their “prize” comics. A decent-looking copy of ASM #43 had always been elusive for me, which was especially troubling because I had a certain attachment to the comic itself. 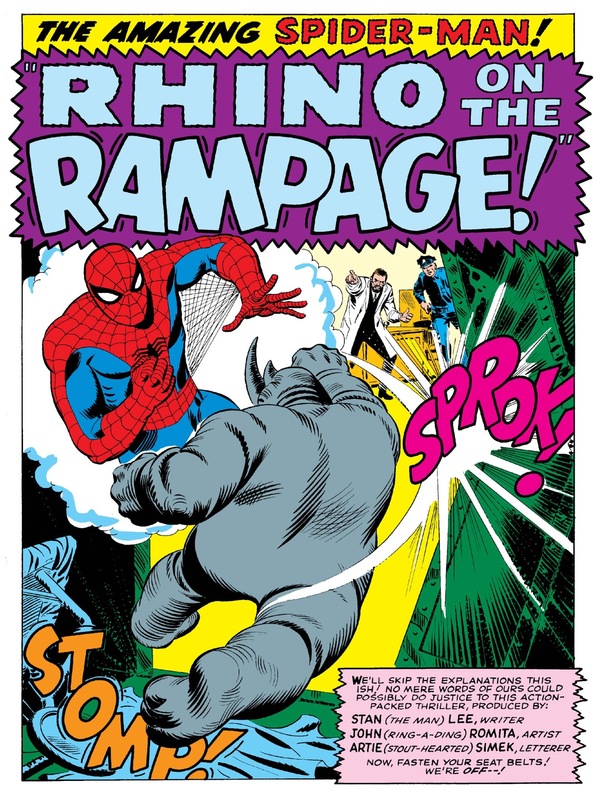 It’s the second full appearance of the Rhino — a villain, who, up until about 10 or so years ago was a pretty minor baddie in the Spider-Man pantheon. 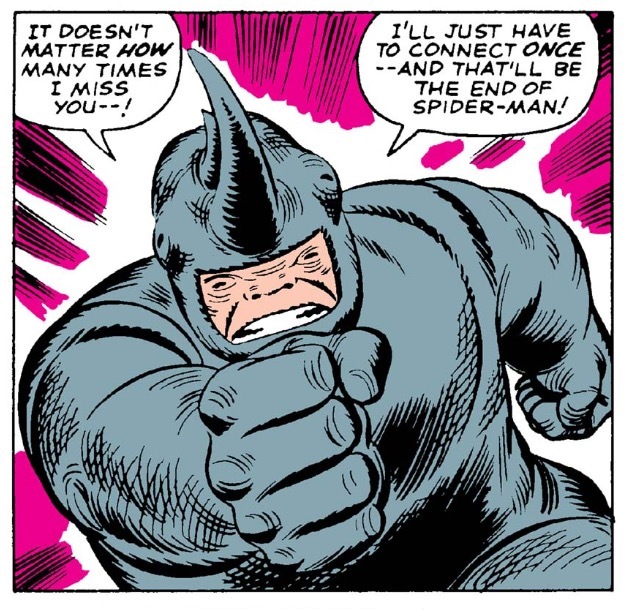 However, he was also the featured villain in what I like to call my “first” “first appearance,” aka the first Silver Age Spider-Man comic I picked-up for my collection that had a somewhat major Marvel character appearing in it for the very first time (while Rhino never clicked with Spidey, he certainly became a worthy adversary for the Hulk). Additionally, this marks the second appearance, and the first extended appearance of one of the biggest supporting characters in Spider-Man and Marvel history, Mary Jane Watson. I already owned the renown “Face it Tiger/Jackpot” issue (though the circumstances behind how I purchased that one remain foggy, which is probably why I’m yet to do a post on it), but MJ’s razzle dazzle in ASM #43 is arguably even more memorable. 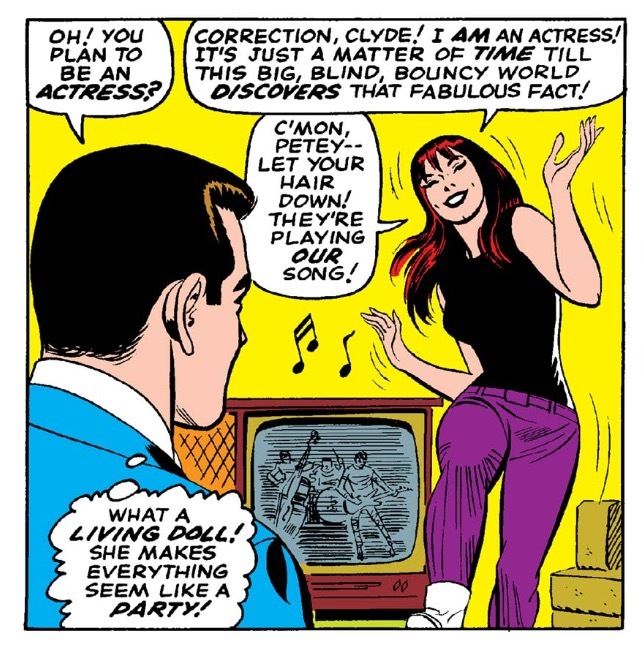 As the great Wade Wilson and Blind Al pointed out in their own comic book series years later, MJ twirls and whirls around Peter’s house like she’s either on a heavy dose of amphetamines, or she got knocked in the head by an anvil. Either way, it’s one of those Stan Lee/John Romita scenes that’s so bad, that it’s actually quite great. So, yes, I NEEDED to own ASM #43. I asked the vendor if I could more closely inspect his wall copy and he obliged. As I initially get it a once over from the outside of the protective mylar bag, the seller wanted to let me know because the show was closing up shop in a few hours, he was going to knock 20 percent or so from the listed price. So, he definitely had my interest piqued financially. The book looked nice enough from the outside, but despite the fact that I started this post by admitting how many mistakes I’ve made over the years when purchasing my ASM collection, I decided to do a little more due diligence and inspect the book outside of the mylar bag. I asked the seller’s permission and he had no problem. While holding the comic in my hand, again, it looked right and felt right. Then I turned it over to check the back, and suddenly things got dicey. I noticed a rather sizeable tear/hole on the back side of the comic, probably about the size of a quarter. And it wasn’t a perfectly made hole either. It looked like the back of the cover got caught trying to scale a barbed wire fence and ripped one way, struggled to get free, and then ripped another way. Here’s the thing. It still wasn’t a dealbreaker for me. Yeah, there was a hole, but it was on the very back of the comic. Once it was in the bag and board, nobody (except for me and the guy who sold it to me) would ever know it existed. In past posts, I’ve always talked about how I’ve always prioritized the aesthetic of the front cover, specifically the central image of action, as opposed to the inside of the book or the back, especially if it could save me a few dollars. The problem was, even with this guy’s 20 percent discount, the tear was a significant enough defect, that I don’t think the book was truly worth what he was charging for it. I tried to argue him down a few dollars, but because I really wasn’t buying anything else from this guy, I didn’t have the leverage that comes with the old trick: “what if I buy these two or three books, will you know 10 bucks off for me” (that’s like the only negotiating trick I’m good at). And yet I was STILL tempted to make the purchase. Maybe I was overstating the size of the tear, or how jagged the hole looked. And maybe my estimate of what this comic, in the condition I deemed it to be, should cost, was too conservative. Was I talking myself out of a golden opportunity to finally get a comic I’ve long desired? Fortunately, my wife was with me during this deliberation and she could see the conflict plainly on my face. My wife happens to be a master negotiator, and while we both realized getting a few dollars knocked off the price was a losing battle, she was trying to figure out from me if there was any other tricks she could play to make this sale happen. She asked if I would be happy owning this comic for this amount and I admitted that I wouldn’t be. So then we did what were supposed to do … we walked away. As we left the table, my wife admitted she fully expected the dealer to finally give in and knock a few more bucks off the price of the book. But maybe he wasn’t a good negotiator, or he was a GREAT negotiator. Either way, he wasn’t budging, and that was that. No ASM #43 for me. Flash forward a few years and while browsing one of the online comic book retailers, I found a great looking copy of ASM #43. I got scans of the front AND back cover, and lo and behold, no giant ragged holes in the back. And the book ended up being cheaper than what I was going to pay at the show. I added it to my virtual shopping cart, submitting my payment info, and viola, about a week later, I finally got my copy of ASM #43. I just had to wait a few years for it and do the hardest thing I’ve ever had to do before when buying a comic. It’s hard to be patient, you get that fever and the next thing you know it’s sitting in a box in your basement and you are left wondering if you should have bought it. I was going crazy a few years ago buying back issues but I think I have all the ones I really wanted (except 1-20) and they are out of my range. I recently made the switch to just trade paperbacks. It bummed me out at first but now I like getting the whole story in one shot. Over all Amazon is cheaper by the trade then buying the individual books. I’m a terrible negotiator. If I want something, I want it, and that’s that. However, I’m not too picky about the condition of my purchases. 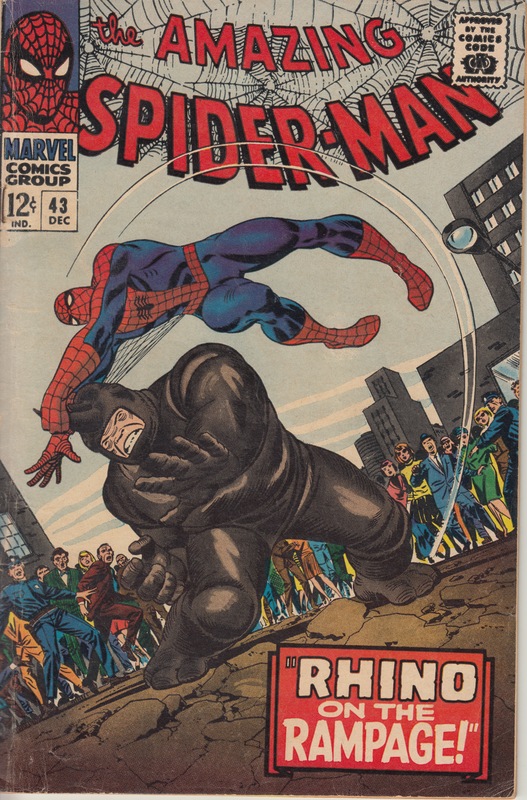 I do have to say, though I’m not a Spidey devotee, I read this issue (and #41-42) recently and thought it was great. Lots of interesting stuff going on, plus some boog Stan Lee humor, and some excellent John Romita art!